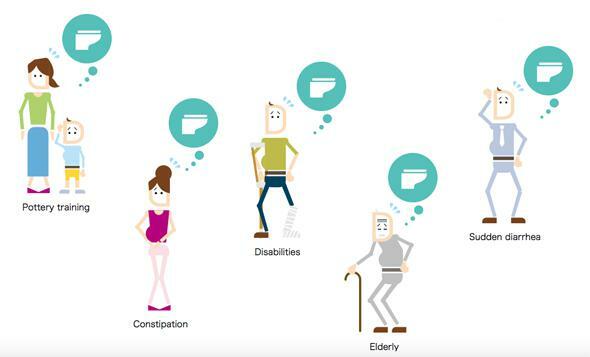 Dfree wearable warns users about imminent bowel movements. Wearables want to solve every body problem. Need to know how much sun you’re getting? Want a tailored sleep analysis or physical fitness evaluation? Wearables. But these promises aren’t always fulfilled, and the one-size-fits-all approach can feel like a letdown after all the hype. Maybe wearables should just try to do one thing well in an area that could make a big difference. That’s Dfree’s approach. Japanese company Triple W Japan has been refining Dfree for the past few years. It’s a wearable that clips onto a user’s underwear and keeps track of their bowel movements, sending data to the user’s smartphone for reminders to use the bathroom. For the elderly, disabled, or those with intestinal illness, the device could have obvious benefits in areas like personal hygiene, independence, and quality of life. Last week the company presented the latest version of the wearable at the Combined Exhibition of Advanced Technologies conference in Tokyo. Dfree hasn’t been released for general sale yet, but Reuters reports that Triple W Japan is working on a spring release. Some product testers have reported skin irritation from the mechanism Dfree currently uses to attach to underwear, so the company is working on refinements. This is an especially important component to get right since some people may use the device on their babies. This is not the main use case Triple W Japan is envisioning, but it seems inevitable. It does sometimes feel that humans are looking to automate every small task they possibly can, but I can’t really bring myself to be concerned about it in this case. In general the human body seems maximally optimized to send “I need to poop” signals. For someone who isn’t struggling with incontinence, I don’t see why using this device would be helpful or appealing. But for someone who is, it could make a deeply meaningful difference.